The Citadel is a rather obscure power/progressive metal band from Sweden. A Passage through Eternity is a 5 song EP, the first since their 2007 debut Brothers of Grief (which I know nothing about). A single listen convinced me of The Citadel's talent. While not necessarily reinventing the power/prog wheel, this crew offers sound, convincing, and entertaining arrangements for the genre. Heaven and the well-developed When the Storm Begins are representative classic tracks. As to individual performance, I was rather impressed with Jonas Radehorn's vocal work. Although I wasn't convinced at the start, on the longest cut A Voice Within, Mr. Radehorn's has both strength and versatility. I doubt whether my fellow American metal brethren will be able to get a physical copy of A Passage through Eternity. But, if a digital copy is available at a good price then, by all means, both here and in UK/Europe, prog metal fans should check this out. Recommended. 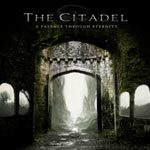 Though brief, and hardly turning the prog/power metal genre on its collective head, The Citadel EP, A Passage through Eternity, is a solid and entertaining work.